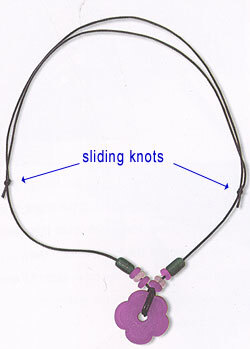 Slidiing Knots Finishing Technique works best with leather thongs because it allows the knots to slide better. 1) Cut a thong with a minimum length that will give a loose fit over your head. Make it longer if you would like to have a long-to-short variable length necklace. 2) String your beads according to your design. 3) Place the ends of your thong so that both ends of your thong overlaps and the ends are sitting directly opposite from each other. 4) See the diagram. 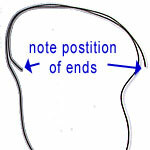 On the right side of your necklace, take that end: and pass the end according to the diagram. 5) Same with the other side: following the digram. 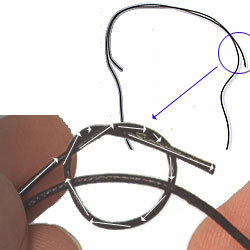 6) Tighten both knots but make sure to leave a short end outside the knot so that they don't unravel. 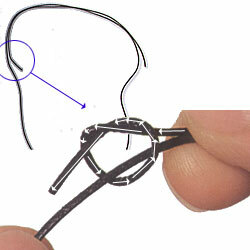 7) These sliding knots can be moved up and down which gives you an adjustable-length necklace.